Don’t know what to get the shoe lover in your life for Christmas (or whatever holiday you celebrate)? Obviously, it’s hard to buy shoes for someone, so we’ve found five great gift ideas, all under $20 that I guarantee any shoe addict will love to unwrap this upcoming holiday season. Calendars are great gift ideas for everyone! Whether you’re looking for a wall or desk shoe calendar, we found plenty of options. Whether you purchase a daily, weekly or monthly shoe calendar, your recipient will think of you every time they look at it! Click here for all shoe calendars available. Prices range from $5 to $15. These super cute cake servers with high heels are available in leopard print, gold or silver sparkles, bejeweled in emerald, ruby or amber and more! Buy now from Amazon! When I found this gorgeous crystal pendant necklace on sale, I said “Merry Christmas to me” and ordered it instantly! 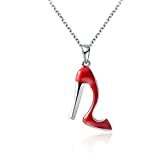 See several other high heel shoe necklaces on sale for under $20 at Amazon. 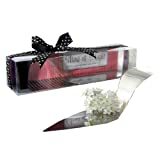 If your shoe lover also likes wine, a shoe wine holder is the perfect gift! Especially one that looks like a Christian Louboutin peeptoe pump as seen above! We found some super cute shoe wine holder styles at Amazon.com under $20. Pair a shoe wine holder with a bottle of wine, and your shoe lover will definitely love you forever! 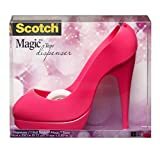 Any shoe addict would love these super cute Scotch tape dispensers shaped as shoes that are filled with Magic tape. They are available in a variety of shoe shapes from pumps to mary-janes to sandals. 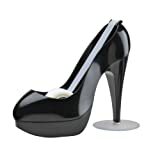 See the above shoe tape dispenser and more for sale at Amazon. What do you plan to buy for the shoe lover in your life?